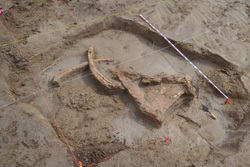 The bones of an Ice Age mammoth have been discovered on the Kansas plains, just steps away from where ancient hunters left evidence of having hewed hunting tools out of stone. It’s not clear whether the two finds are from the same time, but if they are, it could rewrite the history of hunting — and human habitation — on the ancient prairie. The sites were uncovered together by earth-moving equipment in 2011, near the town of Scott City in western Kansas. Soon thereafter, geoarchaeologist Dr. Rolfe Mandel of the Kansas Geological Survey was sent in to make sense of the scene. The first deposit revealed hundreds of scattered bones of an adult mammoth, including a nearly complete tusk, a shoulder blade, plus a skull and teeth that have yet to be excavated. 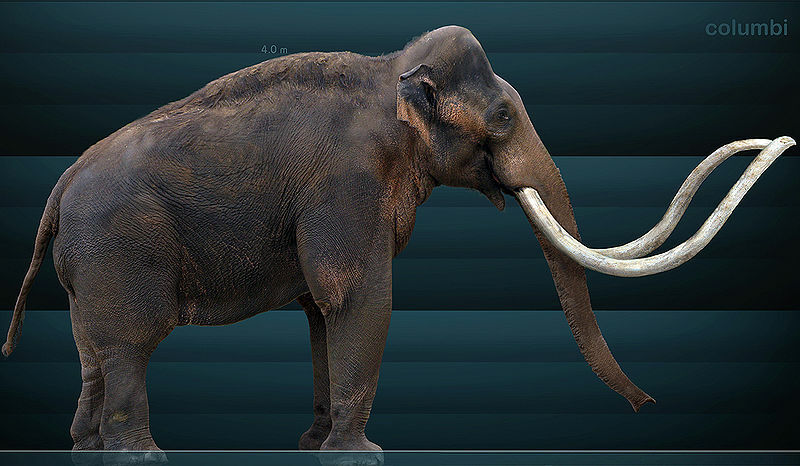 Remains of a mammoth found in Kansas have been dated to 15,500 years ago. About 45 meters away sat a knapping pile — a heap of flakes leftover from the process hunters used to fashion spearheads and other tools out of stone. Radiocarbon dating revealed the mammoth remains to be 15,500 years old, 2,500 years older than any previously known evidence of humans inhabiting the region — older, in fact, than the period known as the Clovis era, named for the distinctive stone hunting points thought by some to be the earliest signs of human culture in North America. But the age of the newfound stone flakes, which can’t be radiocarbon dated, remains a mystery. “It was intriguing to find a knapping pile and mammoth bones close together in the same geologic layer,” Mandel said in a press statement. The trick has been in finding the proof, and Mandel and his colleagues from the University of Kansas have spent half the summer searching for it. For the past three weeks the team has been excavating the mammoth site, looking for clues that can directly link the dead animal to living humans, like fragments of stone points in the remains, or butcher marks on the bones. So far they’ve excavated 25 bones from the deposit, which they estimate is about 7 percent of the total carcass, and they’ve resolved to return for next summer’s field season to continue their investigation. If confirmed, human-made stone flakes dating back more than 15 millennia would likely be the oldest — though surely hotly contested — artifacts ever found in North America. 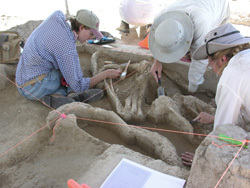 They would pre-date the remains of mammoths and Ice Age camels that Clovis-era people butchered, near what’s now the Kansas-Colorado border, more than 12,000 years ago. They would even exceed in age the preserved human feces found in Oregon’s Paisley Cave in 2007, which dated back 14,300 years. For now, Mandel is cautiously exploring the context of both the flakes and the bones. He acknowledged that there may be scenarios in which the artifacts seem to appear in the same chronological layer as the bones, but actually come from a later date. “The question is whether the stone flakes that were exposed … were really from the same elevation as the mammoth bones or were deposited in a pit dug years after the mammoth died at the location,” he said. I see this article was posted about three years ago. Has work continued at this site? Were only flakes recovered or were there some tools or partial, broken tools? If so, have any of those tools (or flakes) been tested for residual proteins/DNA?